In searching around for this ideal shaping, only one signal was found which was shaped thus, and it wasn't a ham station, not even a commercial, it was NSS. Not even W1AW can boast of the signal shape that it recommends; there is much left to be desired. The slope of the leading and trailing edges suggests an absence of clicks. The carrier is smooth with no hum modulation. It is crisp and clean, and easy and pleasant to copy—assuming, of course, that the paddle manipulator is doing a good job. There are quite a few of these signals around I am happy to report, but percentage-wise they are far too few. There is one thing the form will not reveal—a chirpy signal. It can have good form and still sound poorly. This signal sounds good. 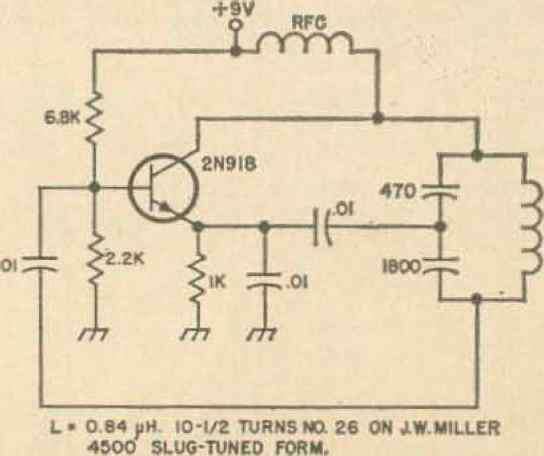 Matter of fact, it is hard to tell it from the previous signal It suggests, however, that the power amplifier power supplv regulation leaves something to be desired. There are quite a few of these signals on the air. Here's one that probably does not generate broadband clicks, but does tend to sound clicky-thumpy. Fig. 4, its hard to describe, it seems overly crisp. However, for a QRQ hound, I think I would prefer it to some of the softer signals. The leading edge hits you with a loud bang and assists in resolving the characters at high Speeds, I am unable to diagnose the reason for this particular shape except perhaps that somewhere in the transmitter there is a regulated power supply which loses control when the key is depressed, then begins to recover about the time the key is let up. Though this may not look it, it has a pleasant and crisp sound, and is free of clicks. It is very similar to Fig. 3 except it is modulated by a test pest who has his key down for a long period. The scalloped edges produce the audible beat which adds to the pleasant sound (to me). Here is one that's hard to figure. No clicks, no thumps—sounds clean and crisp. Fig. 7 will drive you frantic. This really should not be permitted on t he air. 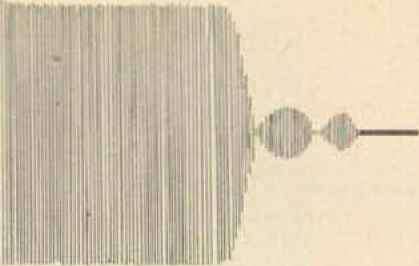 The clicks were heard 15 kHz each side of the center frequency—in spite of a 500 Hz filter. ing f lie main body? Perhaps it is relay bounce if keying relay is used, I seem to recall that this particular operator said something about time sequence keying which might rule out the keying relay in the amplifiers. Whatever it is, it sure messes up another fellows QSO even 15 kHz away. Here's one that can boast of a good regulated power supply and plenty of key click filtering—as a matter of fact, the owner seems to have gone overboard in trying to eliminate key clicks.